Looking at the raw clock speeds of the processors powering both phones, you'd think that the Samsung Galaxy W will have an advantage of around 40%. It's not all down to the CPU however, other hardware components and a finely tuned software can make a world of difference. In CPU-intensive benchmarks like BenchmarkPi and Linpack, the advantage is actually around the 40% mark. The Galaxy W even approaches the performance of its dual-core sibling, the Galaxy R (which runs its two cores at a lower clock speed of 1GHz). 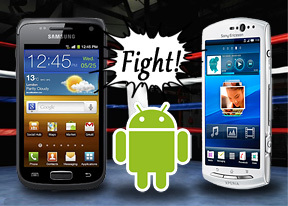 The Galaxy W is more expensive than the Xperia Neo V though. A Samsung Galaxy Ace that is currently priced the same as the Neo V fails pretty badly in these tests. The Neo V has a slightly higher resolution (just under 7% more pixels), which puts it at a disadvantage in the 3D performance test. The difference in results, however, is much more dramatic - the Galaxy W tops 30fps, while the Neo V can't even hit 15fps. The Galaxy W shows practically the same result as the NVIDIA-powered Galaxy R.
Just for fun, let's throw some Windows Phone handsets into the mix for the web browser test - both use the exact same chipset as the Galaxy W. In this test, the Sony Ericsson Xperia Neo V recovers some lost ground and beats its opponent in both SunSpider and BrowserMark. The Windows Phones are far behind, barely managing to outpace the aging Samsung Galaxy Ace. We expected the two phones to be practically tied in 3D gaming but results were strongly in favor of the Samsung Galaxy W, which clearly has the faster CPU too. Where it needs work is web browsing - here the Xperia Neo V beat it by a sizable margin, thanks to better software optimizations. Both handsets did great in the first part of our audio quality test. The Sony Ericsson neo V is the winner here, due to its higher volume levels, slightly better frequency response (the Samsung Galaxy W has its extreme bass frequencies cut-off) and perfectly low intermodulation distortion. 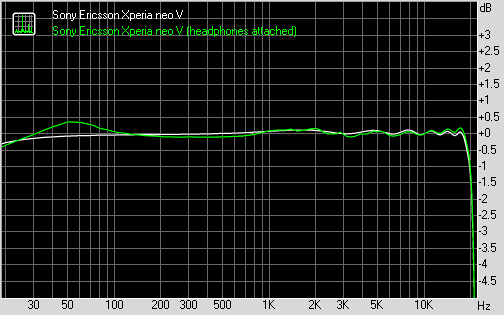 Things are much closer with headphones plugged, the Galaxy W experiencing less degradation than its competitor. 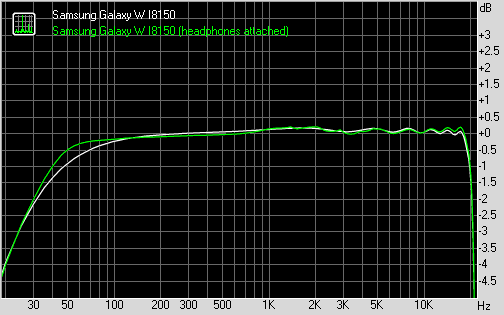 It wins by the slightest of margins in terms of stereo crosstalk and intermodulation distortions, while losing in the THD and frequency response readings by a comparable amount. Overall the two smartphones are nearly identical in terms of audio output and users should be equally happy no matter which one they choose. We've had enough time to form impressions of these inexpensive smartphones. They're classic midrange packages with solid feature sets but the goal is clearly to stay within budget rather than impress anyone with specs. For a few bills more, users are getting better performance (especially in games) and a better camera (both stills and video) out of the Samsung Galaxy W I8150. But they'll have to install a custom ROM if they want Android 4.0 Ice Cream Sandwich (Cyanogen Group is working on one). Of course, the Samsung Galaxy W is not for geeks only, but they're usually the ones who care about benchmark scores and are keen on zooming into photos to look for artifacts. Buying the Sony Ericsson Xperia Neo V will save you some cash and you'll be getting a hassle-free upgrade to Ice Cream Sandwich and a simple way to view photos and videos on an HDTV. It has the better screen and a faster web browser too. The average user will be fine either way, knowing they got a good enough phone for a reasonable price. The Xperia Neo V is better than the Galaxy W on a couple of counts. It seems to be the one with more bang for your buck. Alternatively, the Samsung Galaxy W is the power player and also has the looks to go with it. We just don't think squeezing every drop of performance is make or break in this price range.